To start the diesel engine when the engine is cold, it has to be pre-heated before starting the engine and then have to be warmed up before starting to drive. 1.Make sure the parking brake is applied. 2.Manual Transaxle - Depress the clutch pedal fully and shift the transaxle into Neutral. Keep the clutch pedal and brake pedal depressed while turning the ignition switch to the start position. Automatic Transaxle / DCT* - Place the transaxle shift lever in P(park). Depress the brake pedal fully. You can also start the engine when the shift lever is in the N(neutral) position. 3. Turn the ignition switch to the ON position to pre-heat the engine. 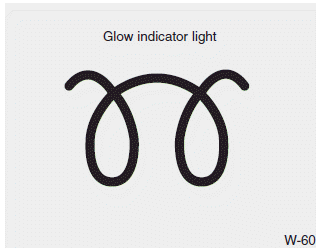 Then the glow indicator light will illuminate. 4. If the glow indicator light goes out, turn the ignition switch to the START position and hold it there until the engine starts (a maximum of 10 seconds), then release the key. If the engine does not start within 10 seconds after the preheating is completed, turn the ignition key once more to the LOCK position for 10 seconds, and then to the ON position, in order to preheat again. 1. Do not race or accelerate the engine immediately after starting. If the engine is cold, idle for several seconds before sufficient lubrication is ensured in the turbocharger unit. 2. After high speed or extended driving, requiring a heavy engine load, run the engine on idle condition about 1 minute before turning it off. This idle time will allow the turbocharger to cool prior to shutting the engine off. Do not turn off the engine immediately after it has been subjected to a heavy load. Doing so may cause severe damage to the engine or turbo charger unit.